It is a good time to be a gamer. Technological advances have made our gaming experiences more immersive and more full of potential than ever before. One of the best advances in recent years is the ability to play games between multiple devices, allowing us to play comparable versions of some of our favourite PC and console games on our mobiles and tablets, and having them all tie together. Dragon Eternity began life as a browser-based MMORPG, but now you can take your progress to your Android or iOS device for role-playing on the go. 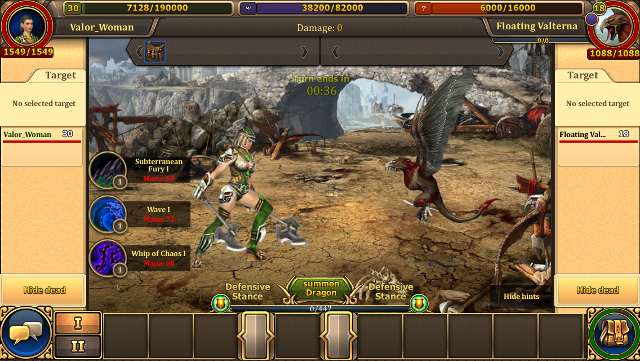 This is a game that adopts a familiar fantasy setting, one of swords, sorcery and dragons. Two warring factions, Sadar and Vaalor, reside in the world of Adan, battling over ownership of the Empire of Tartu. 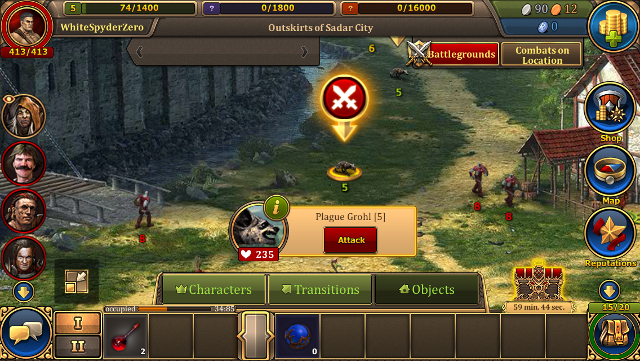 Meanwhile, the Dark Gods of Shaab regularly send their deadly armies from the Abyss to assault Adan. As a warrior of either Sadar or Vaalor, you must take your character from trainee to fearless Dragon Knight – a shining beacon of hope in Adan’s darkest times. There’s a lot of lore here. While the game itself doesn’t explain the setting particularly well (that information can be cleaned from the rather expansive website), there is an absolute ton of text to read. While I never found it to be the most enthralling of narrative strands, it’s well written and serves the game well. One thing to note is that, as an MMORPG, Dragon Eternity requires a constant data connection. If you lose connection for even a few seconds, you’ll be unable to play the game, making it unsuitable for the morning/evening commute. It’s an understandable requirement, given that the game features multiplayer interactions such as Player vs. Player combat and group raids. As per any MMORPG, expect some hefty upgrade installations upon starting the game, and be prepared for it to try to load a massive intro movie the first time you play. Luckily, you are given the option to skip these updates and intros and just play, but it might have made more sense to facilitate these upgrades via the device’s own application upgrade functions. Once those formalities are over, you are taken into the game proper. The actual game-view takes up the middle of the screen, and is bordered on all sides by a ton of menus and stats. Played on a smaller device (an iPhone 5, for instance), everything is a little small and crunched together, but the game is still playable. 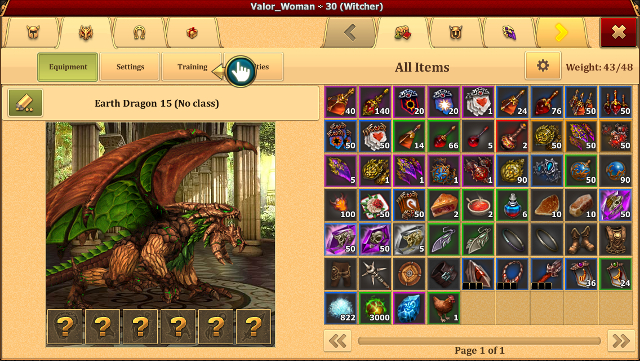 All things considered, if you have an iPad, Dragon Eternity would be best enjoyed on a larger screen. From the very start, you’re given a massively helpful guiding hand. Early quests do a thorough job of explaining every aspect of the mechanics, from navigation and classes to combat and item usage. Gameplay is mainly quest-driven, as you’ll meet people who require you to partake in various tasks, most of which revolve around travelling to one area, killing some enemies, then travelling to another area. Combat is a simple turn-based affair; at times you’ll be joined by others, while eventually you’ll be able to fight alongside a dragon. Ultimately, though, Dragon Eternity is an utter grind-fest. What you’ll experience in the initial tutorial stages is exactly what you’ll experience in later levels: flicking between environments through menus, touching enemies to engage in combat, occasionally buying and selling items and reading a whole bunch of text. It’s all so monotonous. At times, it feels like you’re playing an inferior version of the game if you use a mobile, as there are many times where you’ll be given a quest, only to be told that you can’t complete it on the mobile version and you are given the option to skip it – which counts as completing it. Maybe the developers intend to eventually expand upon the mobile version to bring it up to par with the browser version but, at the time of writing, it’s odd to say the least. Which is a shame, because this is an incredibly polished game. It’s filled with beautiful 2D artwork for the environments and during NPC dialogue, while the combat visuals look good – although, when you first start a battle, it takes far too long for characters to be drawn on screen. It’s certainly one of the better looking mobile games out there, even if the fantasy is a little too generic. The same can be said for the audio, which uses typical orchestral tracks to set the scene. Presentation is certainly one of Dragon Eternity’s stronger points, and it’s clear that a lot of effort went into creating its world. VERDICT: The game itself is free (with in-app purchases for in-game money), but that said – and as beautiful as the world of Adan is – it counts for naught when the tasks you are given as a Level 1 character barely differ from those of Level 30. If you can handle the grind, there is a lot of RPG content here; at the very least, it certainly feels like this mobile version would be a nice accompaniment to the browser version. Dragon Eternity is a solidly built game that’s just lacking the variety required to make it worth putting the time in.